Diving the island pearls of Indonesian Borneo’s coastline – Nabucco, Kakaban, Sangalaki and Derawan – from the Tambora liveaboard: the full text of my article for EZ Dive magazine. Indonesia has a “Big 5” list when it comes to choosing a region to dive – Raja Ampat, Komodo, Lembeh and Bunaken, the Banda Sea and Indonesian Borneo. While the first four are all justifiably famous as some of the best places to dive in the world for their various specialities, Indonesian Borneo has largely remained off the diving map over the last few years. Territorially divided between Brunei, Malaysia and Indonesia, Borneo is the third largest island in the world. Sipadan and Lankayan are the most celebrated of Malaysian Borneo’s dive destinations but just a little further along Borneo’s coastline, across the border within Indonesia, lie four islands looping out from the mainland like a pearl necklace that also deserve a lot more attention. These islands are Nabucco, Kakaban, Sangalaki and Derawan, and they are the draw for a couple of intrepid liveaboards recently entering the region to explore further. In recent years there have been resorts located on several of the islands, and for good reason – each area has four to five days worth of interesting diving in a peaceful, solitary setting. A big advantage of Indonesian Borneo is that it has flat calm waters during April to June and huge blue skies, with barely another soul around. Beneath the surface at Nabucco island, however, is a real adrenaline dive in the form of Maratua Channel, also aptly named Big Fish Country. Head down to 25 metres and a truly massive battery of barracuda, hundreds strong, appears out of the blue. Reef hooks are definitely a good idea, as beneath the barracuda sizeable whitetip sharks patrol. Once divers unhook, there’s an exhilarating drift dive through the channel itself, where the distinct spotted markings of eagle rays occasionally flash by. The big advantage of sailing through this region is not only been able to easily dive at all of the island locations, but also to make exploratory forays into new areas unreachable by the resorts. Armed with GPS marks from local guides and advice from fishermen, we spent a couple of days exploring a submerged atoll which sits just off the island of Palau Sambit. The atoll is so big it doesn’t have its own name – instead it has three names for different sections of its horseshoe shaped reef. Its undisturbed tranquility makes it a haven for turtles, which are a common sight on virtually all of Borneo’s sites. Some of the atoll dives were spectacular – our first, at Lintang reef, felt like dropping off the edge of the planet as the dark blue of the early morning ocean contrasted against the bright white rim of sand that suddenly fell away vertically into nothing. Other dives were not so great, which is to be expected as part of exploratory dives but still means the dive guides can be continually teased about it. One nearby island, Palau Balembangan, had the sort of reef you dream about diving on – spectacular hard corals so abundant they’re growing on top of each other, not an inch of the slope to be seen anywhere, lots of plate corals and sponge corals, with years of growth evident in their massive sizes, interspersed with lots of feather stars and fans too. The reef on its own would be enough, but making this aquatic landscape come alive were huge clouds of fish too – butterfly fish, fusiliers, zebra fish – all skittering about and chasing through each other. It gave an electric feel to the reef, a sense of real energy in the water. With the afternoon sunrays filtering through the clear visibility, it was a magically lit up kaliedoscope of movement and colour. Movement of an even rapid kind characterises Kakaban’s signature dive site, Barracuda Point. A lip at 30 metres that requires reef hooks as standard, the ripping current of this dive site brings in big barracuda – each over a metre long – which slice through the blue whilst divers are hanging on for dear life. Whitetips and grey reef sharks are also known to make regular appearances here. Up in the shallows there are a lot of beautiful top side hard corals, which are definitely worth a couple of dives to explore at a more sedate pace. Kakaban itself is actually a large crater of an island, with a non-stinging jellyfish lake located in its centre. Sangalaki is famed for its resident manta ray population, although it’s not guaranteed they will put in an appearance. Apparently best spotted between 10 am and 2pm, we had two dives with tantalising glimpses of mantas at the surface and a brief encounter below before our third dive hit the jackpot before we even got in the water. Besides wheeling around cleaning stations, Sangalaki’s mantas like to skim just under the water’s surface to feed on plankton. Hurriedly getting out of our bulky BCDs and grabbing snorkels, we gently eased into the water and were greeted with the sight of two mantas, both three to four metres wide, looping around each other and around us. The sunlight rippled off their jet black bodies as they passed a hand touch away beneath us and disappeared into the greenish gloom before suddenly reappearing a few minutes later on another feeding run. It was an unforgettable encounter which more than made up for seeing little of the mantas whilst down below. Once regarded as one of Borneo’s best dive destinations, it has to be said that Sangalaki’s corals are currently in a poor state and it’s to be hoped that a new resort can be established and full government support given to the operators to enforce and restore the island’s no take zone and allow its reefs to flourish again. While most of our Indonesian Borneo liveaboard had been about big underwater vistas and big creatures – mantas, sharks, barracudas and more – our final few days at Derawan island were a macro enthusiast’s delight. In contrast to the corals of Sambit or Nabucco, Derawan’s coral is quite scrubby and the viz murky on most occasions. However, patience and a magnifying glass yield a lot of surprises, especially with dive guides who know the territory. One particular site, Shipwreck, is so rich in small stuff like nudibranches, flatworms and squat lobsters that there is rarely a quiet moment. However, the stars of the show at Derawan are undoubtedly the resident jawfish population, who every month release new eggs into the water. The jawfish incubate the eggs within their own mouths which cannot fully shut, presenting divers with what looks like a mouthful of eyeballs as the eggs reach the point where they’re ready to be released. The jawfish release the eggs at full moon each month, and if you do a very early morning dive at 5am you might just get lucky enough to be there when it happens. The jawfish belches the eggs out in a couple of clouds (what a way to be born!) 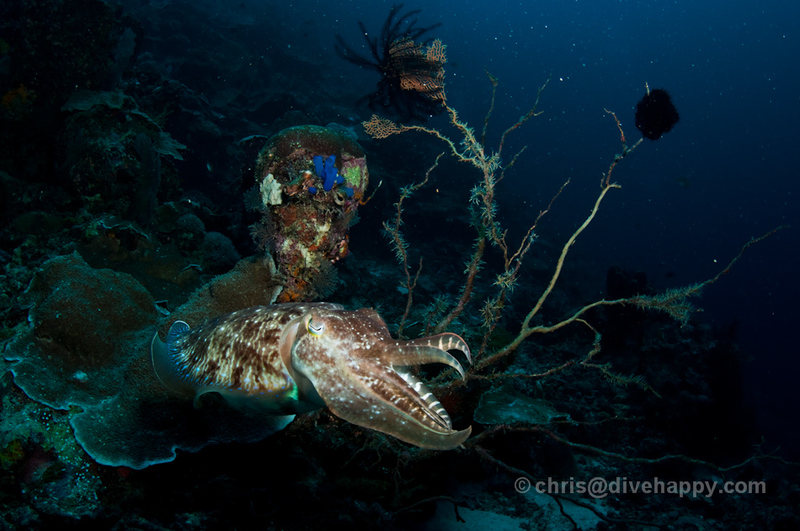 and so begins a new cycle of life on the reef – a tremendous way of ending our Indonesian Borneo trip. This part of Borneo is perhaps more subtle in its diving charms than its counterparts elsewhere in Indonesia, but for underwater serenity away from the crowds and the excitement of exploring somewhere that still has yet to give up many of its underwater secrets, it’s a great choice. Here’s hoping the pearls of Borneo get more recognition and protection in the future. Many thanks to Tambora liveaboard (www.tamboradive.com) for their help with this feature. Liveaboards currently depart from and return to Tarakan. Tarakan is a one hour flight from Balikpapan which itself is a two hour flight from Singapore or Jakarta. Silk Air and Mandala Air fly from Singapore to Balikpapan, and Mandala flies from Balikpapan to Tarakan. Booking domestic Indonesian flights from outside the country is near-impossible – ask your liveaboard to arrange flights for you. Most nationalities can get a 30 day visa on arrival at Balikpapan Airport. The visa costs $25 US Dollars, which is payable in Rupiah, Dollars or by credit card. You cannot currently get a visa on arrival at Tarakan Airport. Bahasa Indonesia is the official language of Indonesia. English is spoken widely, especially on liveaboard boats. Indonesian Rupiah. US Dollars and credit cards are widely accepted, although check ahead with your dive operator to ensure you take acceptable payment.